Please find the downloadable graphic and symbols description at this link, containing the second set of three symbols of The Message of Peace to add to the first three discussed below. The Peace Pole is a Symbol of The Message of Peace, that is all, nothing more! It is NOT of itself an object of worship or veneration or adoration; it is not an object of art; it is not an idol or an icon, or a toy for fools to play with. The Peace Pole is nothing of itself as a physical object that warrants any different treatment than a fence post, or a signpost on a street corner pointing the way to a destination. 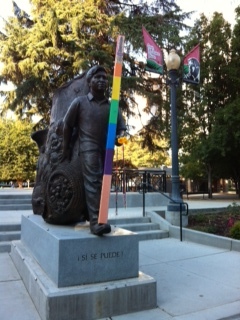 The Official Rainbow Uprising of Consciousness Peace Pole is an open source project so people anywhere/everywhere can make them and install them and use them in any appropriate way including to center a location for vigils, prayers, ceremonies, fasting, meditations, and celebrations for the direct cause of "Global Peace Now!" as the universal human resolve. The only caveat is that this kind of peace pole must never be bought or sold, only made at the maker's expense and offered freely to the user if that is not the maker. This is very important because of the sacred symbols used on this peace pole especially the Hopi symbol because it is part of the Hopi Prophecy (Life Plan) for a future with society functioning without money as we know it. Many people confuse the concept of Wampum as "Indian money", for example, where they believe in the mistaken story that "the Indians sold Manhattan Island for a handful of beads" (implying "how stupid those people were") but in reality the "beads" were exchanged as a form of social contract represented by the various kinds of Wampum which in this case the indigenous people accepted them as tokens of friendship and welcomed the strangers to share the land, which in their way nobody owns the land but it is shared in common. Imagine their surprise when fences started going up! This same caveat and principle is today embodied in the Rainbow Peace Braids, where, "you make them with love, they stand for the message of peace, and when everyone has one we will have world peace.". What makes a peace pole into an official Rainbow Uprising of Consciousness Peace Pole is that it has a specific graphic affixed at the top of one side only of the pole, a graphic which has three symbols that represent important and little known but effective Messages of Peace for the direct cause of "Global Peace Now!" in our troubled time in human history. 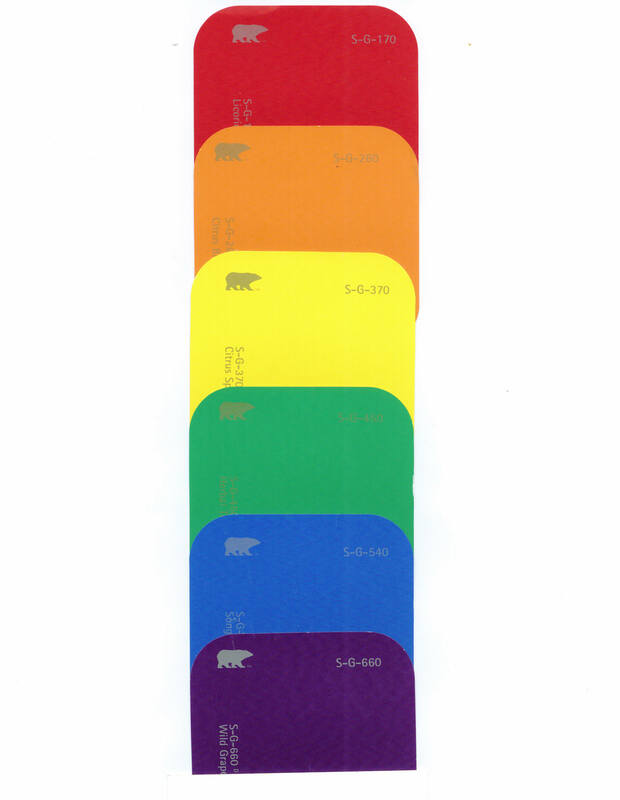 I have posted that graphic duplicated two to a letter size page which may be downloaded, taken to your local copy shop and blown up from its letter size by 152% in color on a ledger size page 11x17 that you can trim into the graphic for two such Rainbow Uprising Peace Poles for the cost of one. They are sized to then be able to fit at the top of one side of a 4x4 post eight feet or more long/tall and glued to the pole and covered with several coats of polyurethane varnish on top of it to weatherproof it. Note that clear nail polish will dissolve the copy ink but petroleum-based varnish like polyurethane, or water-based clear acrylics will not bleed the copy ink. The pole can be covered with roofing tar at the bottom 18"-24" (depending on its length) to go in the ground or concrete protected from water damage. Redwood will be more resistant to bugs and rot. 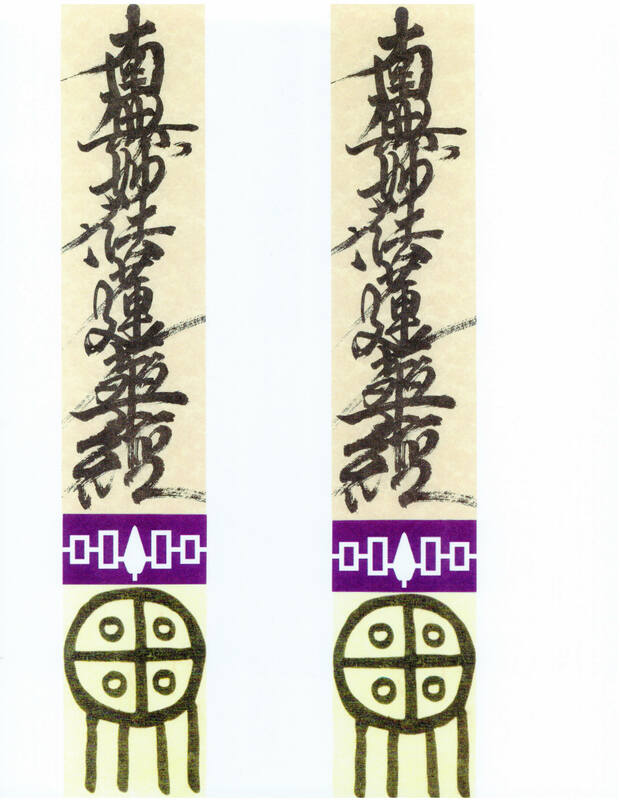 The top symbol in this Rainbow Uprising Peace Pole graphic, the one in the position of the Sun, is the calligraphy of the Na-Mu-Myo-Ho-Ren-Ge-Kyo universal medicine word that according to Buddhist prophecy from 2,500 years ago will bring peace and purify the land and the minds of the people around the world, in our current troubled times described as the Era of the Declined Law, as this medicine word is put to voice with that intention. This is the medicine word mantra that was taken up along with the beating of the celestial drum (Tenku) by Mahatma Gandhi from the man he called Fujii Guruji, his beloved Guru Fujii, the late Most Venerable Nichidatsu Fujii who came to the United States at his age 92 in 1978 to deliver his messages and to join and support the native American indigenous people in their Longest Walk from San Francisco to Washington DC which successfully stopped many bills in Congress against their interest and overturned the US law that had outlawed one of their sacred ceremonies for over 90 years, the Lakota Sundance Ceremony of the Sacred Pipe. 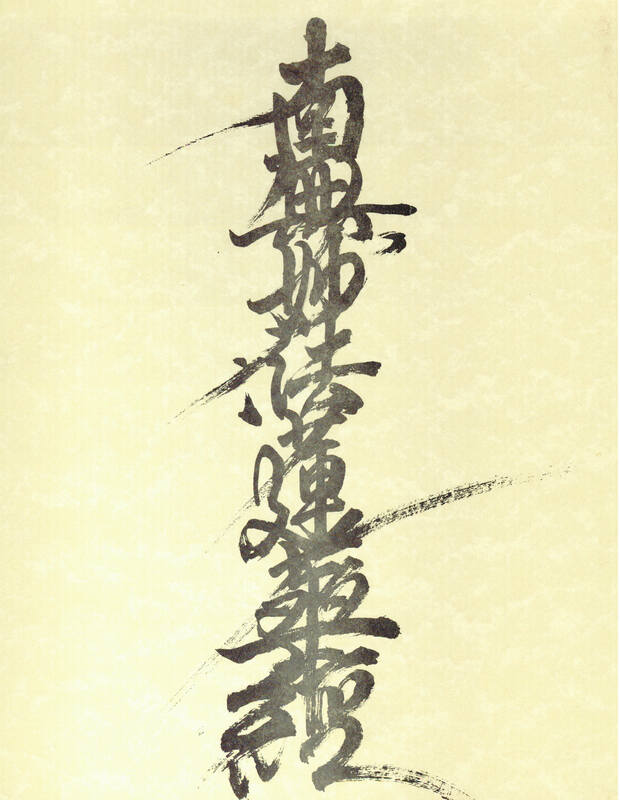 This particular calligraphy of the ancient Chinese characters depicting the Na-Mu-Myo-Ho-Ren-Ge-Kyo was done in 1976 by a Nipponzan Myohoji monk named Reverend Oyama whose name means "Big Mountain" in English and it was given to me by the monk from whom I took up the drum and chanting in December of 1976 who was named Reverend Nippashi which means "Sun Bridge (Rainbow)". Nichidatsu's predecessor Saint Nichiren of Japan had explained over 700 years ago that the putting to voice the sound of this universal medicine word of Na-Mu-Myo-Ho-Ren-Ge-Kyo is the embodiment of the essence of the cosmic law of creation by which everything always operates all of the time without fail with 100% certainty, the law depicted by the Lotus Sutra, similar in concept to The Law in Judaism that even God must follow in the world and that the book called the Torah depicts, and analogous in Islam to the concept of "The Will of God" by which all things always happen without fail all the time in every case without a doubt with 100% certainty, by the very definition of The One God. The drumming and chanting of the Na-Mu-Myo-Ho-Ren-Ge-Kyo prayer, and equivalent prayers from other religions, is seen as part of the fulfillment of the "official" Hopi Prophecy, as explained here. You can read about the story of King Ashoka who 2,200 years ago conquered the whole of the Indian subcontinent by violent and bloody warfare and yet when he was ready and he accepted The Message of Peace depicted by the Na-Mu-Myo-Ho-Ren-Ge-Kyo universal medicine word mantra, he renounced warfare and violence and built many peace poles and peace pillars and peace stupas throughout his realm to symbolize this Message of Peace, which was followed as a result by an era in that territory of over 500 years with no war, no crime and no violence, until the people lost sight of the meaning of the Peace Pole of King Ashoka which is the precedent for today's usage of this symbol and related ceremonies. 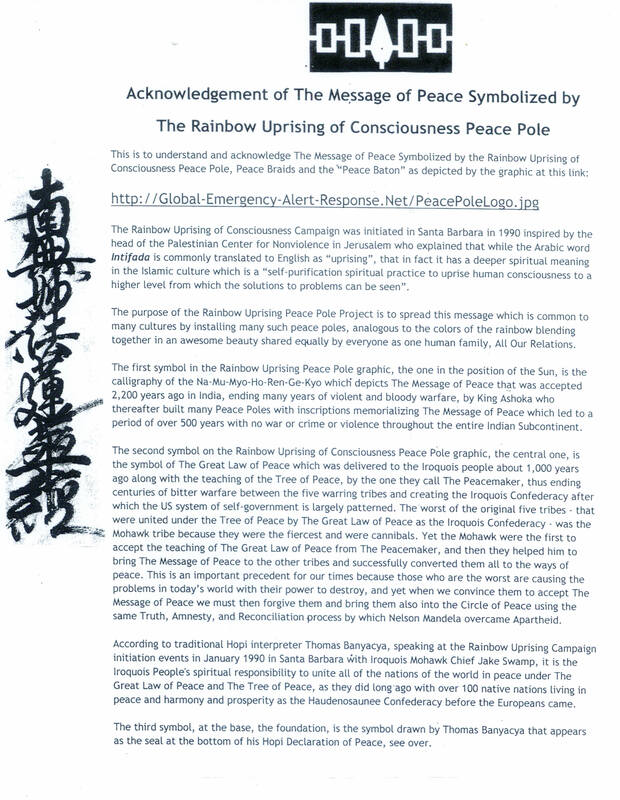 The second symbol on the official Rainbow Uprising of Consciousness Peace Pole graphic, the central one, is the symbol of The Great Law of Peace which was delivered about 1000 years ago along with the teaching of the Tree of Peace, by the one who is called The Peacemaker, to the Haudenosaunee Six Nations Iroquois people thus ending centuries of bitter warfare between the five warring tribes and creating the Iroquois Confederacy that the US system of self government is largely patterned after. 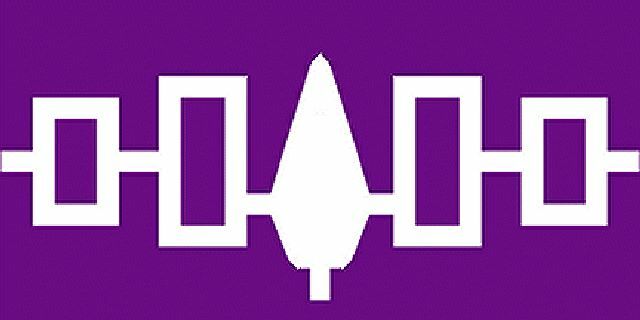 The worst of the original five tribes that were united, under the Tree of Peace by The Great Law of Peace, as the Haudenosaunee Confederacy, was the Mohawk where that name was given to them by the other tribes because they were the most ferocious and were cannibals. Yet the Mohawk were the first to accept the teaching of The Great Law of Peace and helped The Peacemaker bring it to the other tribes to successfully convert them all to the ways of peace. This is an important precedent for our times because those who are the worst are running today's world and have the power to destroy, yet when we convince them to accept The Message of Peace we must then forgive them and bring them also into the human family's Circle of Peace using the same Truth, Amnesty, and Reconciliation process by which Nelson Mandela overcame Apartheid. According to the traditional Hopi interpreter Thomas Banyacya, speaking at our Rainbow Uprising initiation events in January 1990 in Santa Barbara with Mohawk Chief Jake Swamp, it is the Haudenosaunee People's spiritual responsibility to unite all of the nations of the world in peace under The Great Law of Peace as they did before with over 100 native nations living in peace and harmony and prosperity in the eastern US area before the Europeans came and under the still existing Vatican's Doctrine of Discovery that provides to this day the religious authority for the killing of indigenous peoples and the theft of their land, they disrupted this successful government of the people, by the people and for the people. 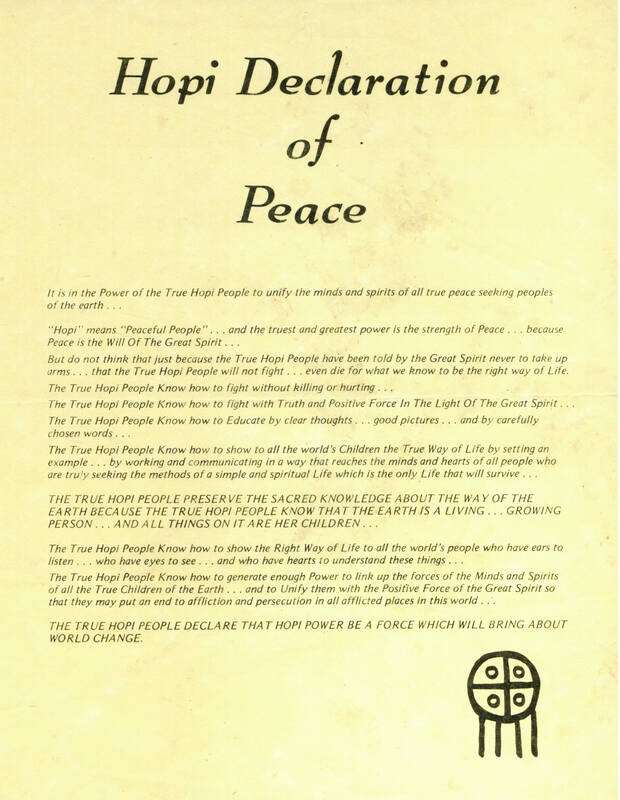 The third symbol, at the base or foundation of the three, is the symbol drawn by Thomas Banyacya that appears as the seal at the bottom of his Hopi Declaration of Peace which he asked that I circulate widely when I spoke with him a few years before he passed into the spirit world on February 6, 1999. Other symbols of the message of peace may be properly added locally to the "official" Rainbow Uprising Peace Poles so long as this graphic is at the top of one side of the pole, where those people affixing additional symbols should explain and record and share what their message of peace symbol means so we can all learn from our collaborations the best way to find the path to "Global Peace Now!" Go to homepage of the Global Emergency Alert Response Network for more information and the 2014 schedule for the Rainbow Uprising of Consciousness Campaign. All My Relations, Mitakuye Oayasin.